Are You Thinking About or Ready to Build? Thinking about a new home? When you decide to build instead of buy existing, you are investing in a truly rewarding experience that will leave you with your custom dream home. From designing the floor plan to picking your selections, every step of the process is exciting, and we are here to help make it as smooth as possible! Here are a few things to think about before you meet with a custom home builder. 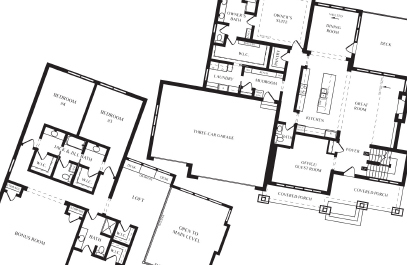 LAYOUT – Start thinking about what you want in a floor plan. Are you looking for a rambler or two-story home? How many bedrooms and bathrooms? Do you want a finished basement? Open concept? What other unique features would you like to have? (i.e. upper level laundry, jack and jill bath, office space, etc.) These wants and needs are a great start as you begin putting together a custom floor plan for your new home. LOCATION – Is there a specific city or area you want to live? Perhaps a certain neighborhood in particular? Maybe you have already purchased a property to build on! If undecided, think about your work commute and school districts to start narrowing down the area. This will help us determine the best area to start our search for your new home location. BUDGET/MORTGAGE – Your budget for the new home is the best way to determine what features and finishes you can add. Meet with a mortgage company to get pre-approved so you know what you are able to afford. Our sister company, Tradition Mortgage, is a great place to start! You may have to sacrifice that indoor pool or sport court if your budget doesn’t allow for it! We stay cognizant of your budget when we start a concept design so we make sure what we show you is something that you can afford and not something that is out of your comfort range. DESIGN INSPIRATION – This is the fun part! Start looking online at Houzz and Pinterest for inspiration. What style of home do you want – contemporary, modern, farmhouse, rustic, eclectic? Or maybe you have a mix of styles? Sharing your vision with our in-house designer will allow us to pull together the perfect selections for your new home. Options for your home are endless when it comes to style, colors, and finishes, so start looking around to see what your likes and dislikes are! Now that we have you thinking about your new custom home, contact to set up a consultation! Our President, Dean Nelson, meets directly with all of our clients to guide them through the design-build process. Please look through our website to learn more about our process and see photos of our homes. For questions or to set up a consultation, call 612-363-6034 or email us at info@homesbytradition.com.